Starting 7’scarlet, I was heavily reminded of another visual novel: Higurashi no Naku Koro ni. Set in a seemingly peaceful country town known as Okunezato, the game blends together urban legends and a murder mystery just like Higurashi. However, as an otome visual novel, 7’scarlet tries to blend together typical dating aspects with a serious and enigmatic plot. The balance between the two elements could possibly ruin the game if not handled right. Take on the role of college student Ichiko Hanamaki as you travel to the quiet Okunezato to find your lost brother. Joining you is the online organization known as the Okunezato Supernatural Club, a group dedicated to the mysteries surrounding the town. The majority of the members are handsome men, some of who fill the roles of cliched tropes. Of course, the childhood friend, Hino Kagutsuchi, joins Ichiko on her quest. Not one but two bespectacled gentlemen, the serious medical student Sosuke Tatehira and the quiet and clumsy Toa Kushinada, are available to romance. But then you have a few outliers, such as the charismatic chef Isora Amari and the uptight hotel owner Yuzuki Murakumo. However, despite the cliches, the men of 7’scarlet are quite charming. Even the owner of the Fuurinkan Hotel, beneath his hostile personality, has some redeeming qualities to him. The writing really backs up the characters; I only found a small amount of spelling and grammatical errors. But besides your missing brother, many other mysteries surround Okunezato, primarily the story of the Revenants. Not quite zombies or ghosts, the Revenants are people that have come back from the dead and show up in the quiet town. In order to remain in the land of the living, the Revenants must kill people to extend their time. Despite its urban legend roots, murders start happening around the town and encourages the validity of the story. Is one of the members of the Okunezato Supernatural Club a Revenant? If so, who? The mystery is really interesting and requires many playthroughs in order to reveal everything about it. And here’s where things get a little tricky. Ichiko initially plans to look for her brother and decides to join Fuurinkan Hotel as a maid to stay in the town longer for free. At the same time, this role interferes with her doing any real searching. Every once in awhile, she will resume her search, but it almost felt like this major plot point is left on the back burner for romance and other shenanigans. I was truly invested in the game’s mystery, which made these moments distracting. However, as an otome game, the game doesn’t quite meet the mark either. Though there are five routes to pursue plus a hidden sixth one, certain characters need to be played in a certain order to unlock other routes. Meaning, if you want to romance Toa, you will need to play the game a second time. 7’scarlet doesn’t blatantly tell you this either; online guides are you friend. 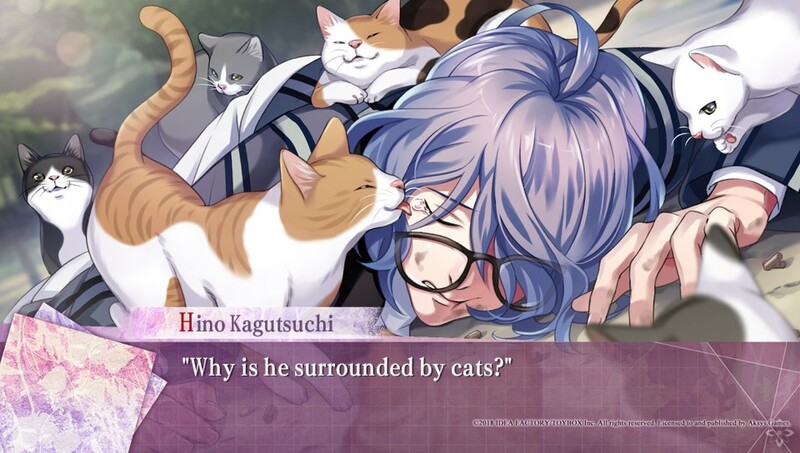 Granted, the order you take on routes does ensure that certain aspects of the plot are not spoiled to the player too soon, it still felt jarring to limit dating choices to a small selection at the start of an otome game. Thankfully, each route lasts less than 10 hours. At least the sound was certain of its identity. The soundtrack perfectly encapsulates the mood of every scene. Though 7’scarlet doesn’t match the grotesque horror of Higurashi, the music heightens at the more tense moments in the story. The voice acting is Japanese only, but the cast seem to play to each characters’ personality perfectly. You do have the option to change the main character’s name, but if you leave it as the default name, characters actually say her name. Visually, the game is beautiful. Of course I could mention the handsome men and their various artwork, but one aspect of the game’s art really stole the show for me: the backgrounds. The beautiful scenery looks like a sketch or even a painting. Furthermore, there are moments when the backgrounds are more lively than the character sprites, such as a forest scene with a flowing waterfall or twinkling starts in a night sky. As a visual novel, 7’scarlet does a lot of things right. Each character has multiple endings depending on your choices. An image of a flower dazzles the screen whenever an answer a character likes is selected. If you screw up, there’s a handy quick save and quick load feature available to make getting the right choices easy. Also, when starting over, the game allows you to choose certain parts of the story to start at so you don’t have to trudge through text you’ve already read. But if so, there is a nice skip feature and previously chosen answers are shown in a dark pink. Lastly, the Tips feature is perfect to develop key terms in the game but also provide some insight on the characters and Japanese culture. 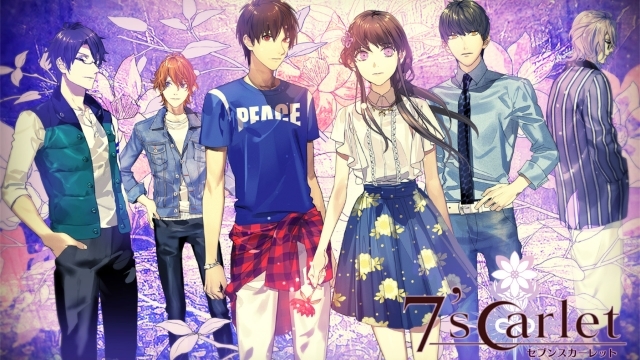 7’scarlet is a game that tries to be a murder mystery and otome game, but doesn’t always succeed at both to sustain a flowing narrative. However, the male protagonists, despite the tropes, are charming and even the supporting characters help add to the story. The moments that really deliver are accentuated by the ambient soundtrack. In this case, the highs outweigh the lows when it comes to 7’scarlet. I must have spent over 20 hours with the game, but I do not regret it. 7’scarlet is available now on PlayStation Vita, physically and digitally, for $39.99.